Restaurant Franchise Opportunity in California! Are you looking for a rewarding restaurant franchise opportunity in California? Lo-Lo’s Chicken & Waffles franchise may be exactly what you’re looking for. Lo-Lo’s is the exciting soul food franchise that has captured the hearts and devotion of passionate foodies from coast to coast, including celebrities and professional athletes! Lo-Lo’s was founded by Larry “Lo-Lo” White, whose restaurant experience dates back to his childhood when he bussed tables at his grandmother’s restaurant. It was her restaurant kitchen that would wind up being the testing ground for Lo-Lo’s now famous scratch-made fried chicken and waffle recipes. It was in 2002 that the first Lo-Lo’s Chicken & Waffles opened, and since that time Lo-Lo’s reputation for delectable chicken and waffles cooked to golden perfection has spread the old- fashioned way, by word-of-mouth from raving fans across the U.S. When Lo-Lo’s became a local and national sensation, it began to command a different kind of attention. In fact, it’s not unusual for Lo-Lo’s customers to be lining up out the doors just waiting to taste Lo-Lo’s savory menu selections. Why is California the perfect location for a restaurant franchise? It’s home to large cities such as Los Angeles, San Diego, and San Francisco. As the most populous state, there is no shortage of customers! California’s economy is so large that it can be compared to that of the largest countries, making it the perfect state to open a restaurant franchise. When you’re interested in opening a restaurant franchise in California, you want a company that offers you the incomparable benefits of a proven business model – this way, you can hit the ground running with all of the potential of a successful restaurant owner. 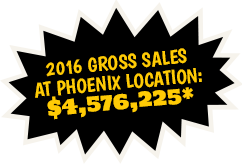 It is a ground-floor franchise concept with unlimited growth potential. We have gained local and national recognition for our delicious, one-of-a-kind recipes. 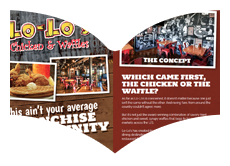 Lo-Lo’s is building a network that franchisees can lean on, learn from and grow with. It’s the first soul food franchise primed for nationwide expansion and unlimited growth potential. Lo-Lo’s franchisees are treated like family and they are given all of the tools necessary to succeed, such as ongoing guidance and the emotional support to run a successful restaurant. We would love to tell you more about the ins and outs of the Lo-Lo’s Chicken & Waffles franchise and why our award-winning soul food recipes beg to be replicated in markets across the U.S. Find out why Lo-Lo’s soul food revolution is like no other!